This article is about generation of electricity using solar energy. For other uses of solar energy, see Solar energy. Not to be confused with Solar luminosity. As the cost of solar electricity has fallen, the number of grid-connected solar PV systems has grown into the millions and utility-scale photovoltaic power stations with hundreds of megawatts are being built. Solar PV is rapidly becoming an inexpensive, low-carbon technology to harness renewable energy from the Sun. The current largest photovoltaic power station in the world is the 850 MW Longyangxia Dam Solar Park, in Qinghai, China. The International Energy Agency projected in 2014 that under its "high renewables" scenario, by 2050, solar photovoltaics and concentrated solar power would contribute about 16 and 11 percent, respectively, of the worldwide electricity consumption, and solar would be the world's largest source of electricity. 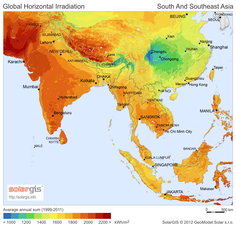 Most solar installations would be in China and India. In 2017, solar power provided 1.7% of total worldwide electricity production, growing at 35% per annum. As of 2018, the unsubsidised levelised cost of electricity for utility scale solar power is around $43/MWh. Photovoltaic (PV) systems use solar panels, either on rooftops or in ground-mounted solar farms, converting sunlight directly into electric power. Concentrated solar power (CSP, also known as "concentrated solar thermal") plants use solar thermal energy to make steam, that is thereafter converted into electricity by a turbine. A parabolic collector concentrates sunlight onto a tube in its focal point. Concentrated solar power (CSP), also called "concentrated solar thermal", uses lenses or mirrors and tracking systems to concentrate sunlight, then use the resulting heat to generate electricity from conventional steam-driven turbines. A novel solar CPV/CSP hybrid system has been proposed, combining concentrator photovoltaics with the non-PV technology of concentrated solar power, or also known as concentrated solar thermal. The Hassi R'Mel power station in Algeria, is an example of combining CSP with a gas turbine, where a 25-megawatt CSP-parabolic trough array supplements a much larger 130 MW combined cycle gas turbine plant. Another example is the Yazd power station in Iran. Hybrid PV/T), also known as photovoltaic thermal hybrid solar collectors convert solar radiation into thermal and electrical energy. Such a system combines a solar (PV) module with a solar thermal collector in a complementary way. A concentrated photovoltaic thermal hybrid (CPVT) system is similar to a PVT system. It uses concentrated photovoltaics (CPV) instead of conventional PV technology, and combines it with a solar thermal collector. It combines a photovoltaic system with a diesel generator. Combinations with other renewables are possible and include wind turbines. Thermoelectric, or "thermovoltaic" devices convert a temperature difference between dissimilar materials into an electric current. Solar cells use only the high frequency part of the radiation, while the low frequency heat energy is wasted. Several patents about the use of thermoelectric devices in tandem with solar cells have been filed. The idea is to increase the efficiency of the combined solar/thermoelectric system to convert the solar radiation into useful electricity. 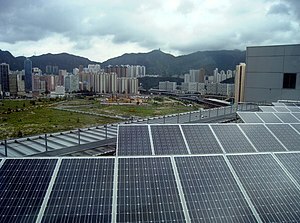 In the mid-1990s development of both, residential and commercial rooftop solar as well as utility-scale photovoltaic power stations began to accelerate again due to supply issues with oil and natural gas, global warming concerns, and the improving economic position of PV relative to other energy technologies. In the early 2000s, the adoption of feed-in tariffs—a policy mechanism, that gives renewables priority on the grid and defines a fixed price for the generated electricity—led to a high level of investment security and to a soaring number of PV deployments in Europe. Concentrated solar power (CSP) also started to grow rapidly, increasing its capacity nearly tenfold from 2004 to 2013, albeit from a lower level and involving fewer countries than solar PV. 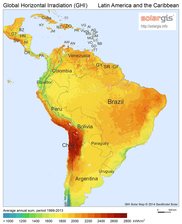 :51 As of the end of 2013, worldwide cumulative CSP-capacity reached 3,425 MW. Ivanpah Solar Power Facility 392 Mojave Desert, California, USA Operational since February 2014. Located southwest of Las Vegas. Solar Energy Generating Systems 354 Mojave Desert, California, USA Commissioned between 1984 and 1991. Collection of 9 units. Andasol solar power station 150 Granada, Spain Completed 2011. Includes a 7.5h thermal energy storage. For a more detailed, sourced and complete list, see: List of solar thermal power stations#Operational or corresponding article. The PV industry has adopted levelized cost of electricity (LCOE) as the unit of cost. The electrical energy generated is sold in units of kilowatt-hours (kWh). As a rule of thumb, and depending on the local insolation, 1 watt-peak of installed solar PV capacity generates about 1 to 2 kWh of electricity per year. This corresponds to a capacity factor of around 10–20%. The product of the local cost of electricity and the insolation determines the break even point for solar power. The International Conference on Solar Photovoltaic Investments, organized by EPIA, has estimated that PV systems will pay back their investors in 8 to 12 years. As a result, since 2006 it has been economical for investors to install photovoltaics for free in return for a long term power purchase agreement. Fifty percent of commercial systems in the United States were installed in this manner in 2007 and over 90% by 2009. 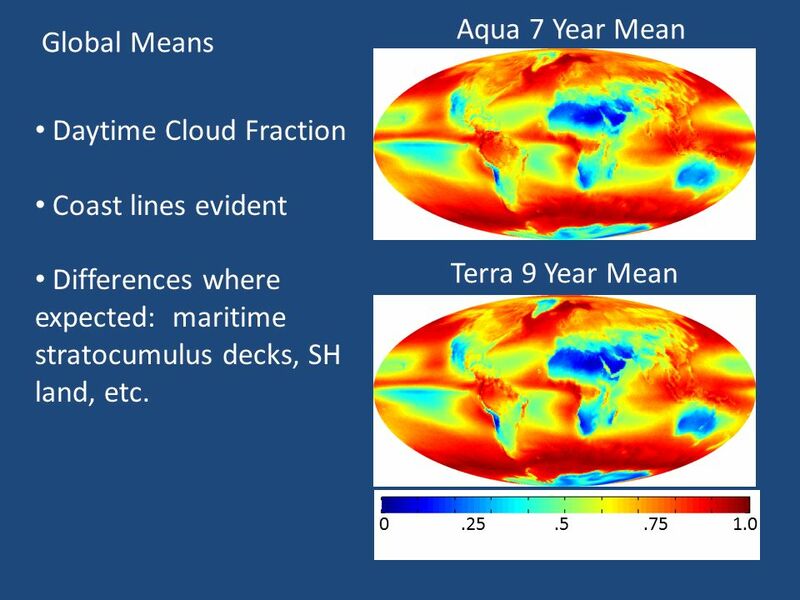 The productivity of solar power in a region depends on solar irradiance, which varies through the day and is influenced by latitude and climate. Net metering, unlike a feed-in tariff, requires only one meter, but it must be bi-directional. The complexity of approvals in California, Spain and Italy has prevented comparable growth to Germany even though the return on investment is better. In some countries, additional incentives are offered for building-integrated photovoltaics (BIPV) compared to stand alone PV. Alternatively, Solar Renewable Energy Certificates (SRECs) allow for a market mechanism to set the price of the solar generated electricity subsity. In this mechanism, a renewable energy production or consumption target is set, and the utility (more technically the Load Serving Entity) is obliged to purchase renewable energy or face a fine (Alternative Compliance Payment or ACP). The producer is credited for an SREC for every 1,000 kWh of electricity produced. If the utility buys this SREC and retires it, they avoid paying the ACP. In principle this system delivers the cheapest renewable energy, since the all solar facilities are eligible and can be installed in the most economic locations. Uncertainties about the future value of SRECs have led to long-term SREC contract markets to give clarity to their prices and allow solar developers to pre-sell and hedge their credits. Financial incentives for photovoltaics differ across countries, including Australia, China, Germany, Israel, Japan, and the United States and even across states within the US. The Japanese government through its Ministry of International Trade and Industry ran a successful programme of subsidies from 1994 to 2003. By the end of 2004, Japan led the world in installed PV capacity with over 1.1 GW. Construction of the Salt Tanks which provide efficient thermal energy storage so that output can be provided after sunset, and output can be scheduled to meet demand requirements. The 280 MW Solana Generating Station is designed to provide six hours of energy storage. This allows the plant to generate about 38% of its rated capacity over the course of a year. Pumped-storage hydroelectricity (PSH). This facility in Geesthacht, Germany, also includes a solar array. The overwhelming majority of electricity produced worldwide is used immediately, since storage is usually more expensive and because traditional generators can adapt to demand. Both solar power and wind power are variable renewable energy, meaning that all available output must be taken whenever it is available by moving through transmission lines to where it can be used now. Since solar energy is not available at night, storing its energy is potentially an important issue particularly in off-grid and for future 100% renewable energy scenarios to have continuous electricity availability. Conventional hydroelectricity works very well in conjunction with solar power; water can be held back or released from a reservoir as required. Where a suitable river is not available, pumped-storage hydroelectricity uses solar power to pump water to a high reservoir on sunny days, then the energy is recovered at night and in bad weather by releasing water via a hydroelectric plant to a low reservoir where the cycle can begin again. This cycle can lose 20% of the energy to round trip inefficiencies, this plus the construction costs add to the expense of implementing high levels of solar power. Common battery technologies used in today's home PV systems include, the valve regulated lead-acid battery– a modified version of the conventional lead–acid battery, nickel–cadmium and lithium-ion batteries. Lead-acid batteries are currently the predominant technology used in small-scale, residential PV systems, due to their high reliability, low self discharge and investment and maintenance costs, despite shorter lifetime and lower energy density. Lithium-ion batteries have the potential to replace lead-acid batteries in the near future, as they are being intensively developed and lower prices are expected due to economies of scale provided by large production facilities such as the Gigafactory 1. In addition, the Li-ion batteries of plug-in electric cars may serve as a future storage devices in a vehicle-to-grid system. Since most vehicles are parked an average of 95% of the time, their batteries could be used to let electricity flow from the car to the power lines and back. Other rechargeable batteries used for distributed PV systems include, sodium–sulfur and vanadium redox batteries, two prominent types of a molten salt and a flow battery, respectively. The combination of wind and solar PV has the advantage that the two sources complement each other because the peak operating times for each system occur at different times of the day and year. The power generation of such solar hybrid power systems is therefore more constant and fluctuates less than each of the two component subsystems. 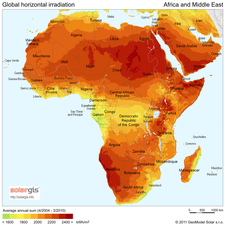 Solar power is seasonal, particularly in northern/southern climates, away from the equator, suggesting a need for long term seasonal storage in a medium such as hydrogen or pumped hydroelectric. The Institute for Solar Energy Supply Technology of the University of Kassel pilot-tested a combined power plant linking solar, wind, biogas and pumped-storage hydroelectricity to provide load-following power from renewable sources. Unlike fossil fuel based technologies, solar power does not lead to any harmful emissions during operation, but the production of the panels leads to some amount of pollution. 2e/kWh. Using the same assumptions, at Phoenix, USA, with insolation of 2400 kWh/m2/year, the GHG emissions factor would be reduced to 32 g of CO2e/kWh. Solar power includes plants with among the lowest water consumption per unit of electricity (photovoltaic), and also power plants with among the highest water consumption (concentrating solar power with wet-cooling systems). Photovoltaic power plants use very little water for operations. Life-cycle water consumption for utility-scale operations is estimated to be 12 gallons per megawatt-hour for flat-panel PV solar. Only wind power, which consumes essentially no water during operations, has a lower water consumption intensity. One issue that has often raised concerns is the use of cadmium (Cd), a toxic heavy metal that has the tendency to accumulate in ecological food chains. It is used as semiconductor component in CdTe solar cells and as a buffer layer for certain CIGS cells in the form of cadmium sulfide. The amount of cadmium used in thin-film solar cells is relatively small (5–10 g/m²) and with proper recycling and emission control techniques in place the cadmium emissions from module production can be almost zero. Current PV technologies lead to cadmium emissions of 0.3–0.9 microgram/kWh over the whole life-cycle. Most of these emissions arise through the use of coal power for the manufacturing of the modules, and coal and lignite combustion leads to much higher emissions of cadmium. Life-cycle cadmium emissions from coal is 3.1 microgram/kWh, lignite 6.2, and natural gas 0.2 microgram/kWh. In a life-cycle analysis it has been noted, that if electricity produced by photovoltaic panels were used to manufacture the modules instead of electricity from burning coal, cadmium emissions from coal power usage in the manufacturing process could be entirely eliminated. Some media sources have reported that concentrated solar power plants have injured or killed large numbers of birds due to intense heat from the concentrated sunrays. This adverse effect does not apply to PV solar power plants, and some of the claims may have been overstated or exaggerated. In addition, most solar panels on spacecraft are also made of high efficient multi-junction photovoltaic cells to derive electricity from sunlight when operating in the inner Solar System. 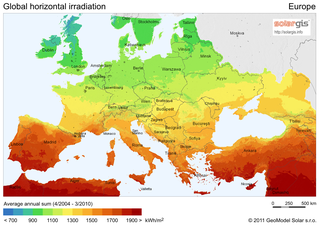 Wikimedia Commons has media related to Solar power. ^ "Energy Sources: Solar". Department of Energy. Archived from the original on 14 April 2011. Retrieved 19 April 2011. ^ a b c d e f g h i j http://www.iea.org (2014). "Technology Roadmap: Solar Photovoltaic Energy" (PDF). IEA. Archived (PDF) from the original on 7 October 2014. Retrieved 7 October 2014. ^ a b c Solar Cells and their Applications Second Edition, Lewis Fraas, Larry Partain, Wiley, 2010, ISBN 978-0-470-44633-1, Section10.2. ^ Corporation, Bonnier (June 1931). "Magic Plates, Tap Sun For Power". Popular Science. Retrieved 19 April 2011. ^ "Trends in Photovoltaic Applications Survey report of selected IEA countries between 1992 and 2009, IEA-PVPS". Archived from the original on 25 May 2017. Retrieved 8 November 2011. ^ Stephen Lacey. "Spanish CSP Plant with Storage Produces Electricity for 24 Hours Straight". Archived from the original on 12 October 2012. ^ "Concentrated Solar Thermal Power – Now" (PDF). Archived (PDF) from the original on 10 September 2008. Retrieved 19 August 2008. ^ a b c "Concentrating Solar Power in 2001 – An IEA/SolarPACES Summary of Present Status and Future Prospects" (PDF). International Energy Agency – SolarPACES. Archived from the original (PDF) on 10 September 2008. Retrieved 2 July 2008. ^ "UNLV Solar Site". University of Las Vegas. Archived from the original on 3 September 2006. Retrieved 2 July 2008. ^ "Compact CLFR". Physics.usyd.edu.au. 12 June 2002. Archived from the original on 12 April 2011. Retrieved 19 April 2011. ^ "Ausra compact CLFR introducing cost-saving solar rotation features" (PDF). Archived from the original (PDF) on 21 July 2011. Retrieved 19 April 2011. ^ "An Assessment of Solar Energy Conversion Technologies and Research Opportunities" (PDF). Stanford University – Global Climate Change & Energy Project. Archived (PDF) from the original on 9 May 2008. Retrieved 2 July 2008. ^ Amanda Cain (22 January 2014). "What Is a Photovoltaic Diesel Hybrid System?". RenewableEnergyWorld.com. ^ a b "Hybrid Wind and Solar Electric Systems". United States Department of Energy. 2 July 2012. Archived from the original on 26 May 2015. ^ "BP Statistical Review of World Energy June 2015, Renewables section" (PDF). BP. June 2015. Archived (PDF) from the original on 7 July 2015. Retrieved 7 July 2015. ^ "BP Statistical Review of World Energy June 2015, Electricity section" (PDF). BP. June 2015. Archived from the original (PDF) on 4 July 2015. Retrieved 7 July 2015. ^ "BP Statistical Review of World Energy 2016 - data workbook". BP. June 2016. Archived from the original on 2 December 2016. Retrieved 11 June 2016. ^ "Photovoltaic Dreaming 1875--1905: First Attempts At Commercializing PV - CleanTechnica". cleantechnica.com. Archived from the original on 25 May 2017. Retrieved 30 April 2018. ^ "Chronicle of Fraunhofer-Gesellschaft". Fraunhofer-Gesellschaft. Archived from the original on 12 December 2007. Retrieved 4 November 2007. ^ a b "Photovoltaics: Overview of installed PV in 2013". Renewables International. 14 January 2014. Archived from the original on 30 March 2014. Retrieved 23 June 2014. ^ a b "2016 Snapshot of Global Photovoltaic Markets" (PDF). International Energy Agency. 2017. Archived (PDF) from the original on 27 August 2017. ^ Colville, Finlay (30 January 2017). "Top-10 solar cell producers in 2016". PV-Tech. Archived from the original on 2 February 2017. ^ Ball, Jeffrey; et al. (21 March 2017). "The New Solar System - Executive Summary" (PDF). Stanford University Law School, Steyer-Taylor Center for Energy Policy and Finance. Archived (PDF) from the original on 20 April 2017. Retrieved 27 June 2017. ^ REN21 (2014). "Renewables 2014: Global Status Report" (PDF). Archived (PDF) from the original on 4 September 2014. ^ "Solar photovoltaic roadmap" (PDF). International Energy Agency. 2010. Archived (PDF) from the original on 24 September 2015. Retrieved 18 August 2014. ^ "DOE Closes on Four Major Solar Projects". Renewable Energy World. 30 September 2011. Archived from the original on 11 November 2011. ^ "10 really cool Solar Power installations in (and above) the world". Retrieved 30 January 2018. ^ "宁夏在腾格里沙漠南缘建成全国最大沙漠光伏集成区 - 今日热点 - 中国储能网". www.escn.com.cn. Retrieved 2017-05-20. ^ "The World's Largest Solar Park - Kurnool, India". Retrieved 1 November 2017. ^ "大同光伏领跑者验收：月均发电量超过1亿度 - OFweek太阳能光伏网". solar.ofweek.com. Retrieved 2017-05-20. ^ "看山西大同示范基地如何领跑全国光伏行业 - 光伏电站 - 中国储能网". www.escn.com.cn. Retrieved 2017-05-20. ^ "China's Top Runner Program Improves Mono-si Products' Market Share to 25%_EnergyTrend PV". 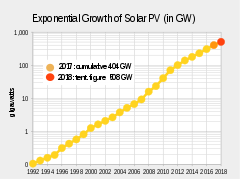 pv.energytrend.com. Retrieved 2017-05-20. ^ Denis Lenardic. Large-scale photovoltaic power plants ranking 1 - 50 PVresources.com, 2011. ^ 李洋. "World's largest solar-hydro power station getting connected to the grid". ^ Author. "KW50 - CPI completes massive hybrid solar PV/hydro plant in Western China - SolarServer". ^ Jun, Zhang (May 2015). "Joint Development Mode of Hydropower and New Energy" (PDF). Upstream Huanghe Hydropower Development Co., Ltd. Retrieved 22 March 2016. ^ "Global hydropower market shows promise for future". ESI-Africa.com. 10 March 2016. Retrieved 22 March 2016. ^ "Country's Biggest Solar Park In Rajasthan, At The Heart Of India's Clean Energy Push". NDTV.com. Retrieved 2017-06-06. ^ "Adani Group launches world's largest solar power plant in Tamil Nadu - Times of India". Retrieved 2016-09-21. ^ "600 MW of Solar Projects Synchronized to the Grid at Karnataka's Pavagada Park". Retrieved 18 February 2018. ^ Reporter, Staff (2 March 2018). "Pavagada solar park inaugurated". The Hindu. Retrieved 2 March 2018. ^ "Earth Observatory image, using EO-1 ALI data". ^ Steve Leone (7 December 2011). "Billionaire Buffett Bets on Solar Energy". Renewable Energy World. ^ "California Valley's Topaz Solar Farm now producing electricity". sanluisobispo. ^ Energy Information Administration. 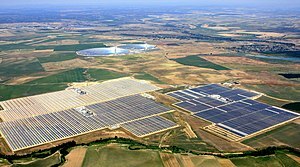 "Topaz Solar Farm, Monthly". Electricity Data Browser. Retrieved October 9, 2013. ^ What is peak demand? Archived 11 August 2012 at the Wayback Machine, Energex.com.au website. ^ "Abengoa Solar begins construction on Extremadura's second solar concentrating solar power plant". abengoasolar.com. Archived from the original on 4 December 2009. Retrieved 30 April 2018. ^ "Abengoa closes financing and begin operation of Solaben 1 & 6 CSP plants in Spain". CSP-World. Archived from the original on 16 October 2013. ^ "Solar Photovoltaics Competing in the Energy Sector—On the road to competitiveness" (PDF). European Photovoltaic Industry Association. September 2011. p. 18. Archived from the original (PDF) on 26 February 2013. ^ "Musk vs. Buffett: The Billionaire Battle to Own the Sun". Bloomberg.com. Archived from the original on 16 February 2017. ^ Jabusch, Garvin. "These 4 solar-power stocks will leave fossil fuels in the dust". marketwatch.com. Archived from the original on 19 August 2017. Retrieved 30 April 2018. ^ US EIA, Levelized Cost and Levelized Avoided Cost of New Generation Resources in the Annual Energy Outlook 2014 Archived 27 October 2015 at the Wayback Machine, 17 April 2014. ^ "3rd International Conference on Solar Photovoltaic Investments". Pvinvestmentconference.org. Archived from the original on 3 May 2009. Retrieved 19 April 2011. ^ "Solar Power Services: How PPAs are Changing the PV Value Chain". 11 February 2008. Archived from the original on 10 May 2009. Retrieved 21 May 2009. ^ Mark Clifford (8 February 2012). "China's visible solar power success". MarketWatch. Archived from the original on 1 August 2013. ^ "Photovoltaic System Pricing Trends – Historical, Recent, and Near-Term Projections, 2014 Edition" (PDF). NREL. 22 September 2014. p. 4. Archived (PDF) from the original on 29 March 2015. ^ "Photovoltaik-Preisindex" [Solar PV price index]. PhotovoltaikGuide. Archived from the original on 10 July 2017. Retrieved 30 March 2015. Turnkey net-prices for a solar PV system of up to 100 kWp amounted to Euro 1,240 per kWp. ^ "Crossing the Chasm" (PDF). Deutsche Bank Markets Research. 27 February 2015. p. 9. Archived (PDF) from the original on 1 April 2015. ^ Kelly-Detwiler, Peter. "Solar Grid Parity Comes to Spain". Forbes. Archived from the original on 2 January 2013. ^ "Gaining on the grid". BP. Archived from the original on 8 June 2011. ^ Reuters Editorial (19 October 2007). "Solar power edges towards boom time". Reuters. Archived from the original on 22 July 2009. ^ "The cloudiest place". www.acgeospatial.co.uk. Archived from the original on 22 August 2017. Retrieved 30 April 2018. ^ Lipponen, Antti (7 January 2017). "The sunniest place on Earth in 2016". medium.com. Archived from the original on 22 August 2017. Retrieved 30 April 2018. ^ "Money saved by producing electricity from PV and Years for payback". Archived from the original on 28 December 2014. ^ a b c Trends in Photovoltaic Applications 2014 (PDF) (Report). IEA-PVPS. 2014. Archived (PDF) from the original on 25 May 2017. ^ Stetz, T; Marten, F; Braun, M (2013). "Improved Low Voltage Grid-Integration of Photovoltaic Systems in Germany". IEEE Transactions on Sustainable Energy. 4 (2): 534–542. Bibcode:2013ITSE....4..534S. doi:10.1109/TSTE.2012.2198925. ^ a b c d Salpakari, Jyri; Lund, Peter (2016). "Optimal and rule-based control strategies for energy flexibility in buildings with PV". Applied Energy. 161: 425–436. doi:10.1016/j.apenergy.2015.10.036. ^ Fiztgerald, Garrett; Mandel, James; Morris, Jesse; Touati, Hervé (2015). The Economics of Battery Energy Storage (PDF) (Report). Rocky Mountain Institute. Archived from the original (PDF) on 30 November 2016. ^ "Net Metering and Interconnection - NJ OCE Web Site". Archived from the original on 12 May 2012. ^ "Power & Energy Technology - IHS Technology". Archived from the original on 2 January 2010. ^ Approved — Feed-in tariff in Israel Archived 3 June 2009 at the Wayback Machine. ^ Wright, matthew; Hearps, Patrick; et al. Australian Sustainable Energy: Zero Carbon Australia Stationary Energy Plan Archived 24 November 2015 at the Wayback Machine, Energy Research Institute, University of Melbourne, October 2010, p. 33. Retrieved from BeyondZeroEmissions.org website. ^ Innovation in Concentrating Thermal Solar Power (CSP) Archived 24 September 2015 at the Wayback Machine, RenewableEnergyFocus.com website. ^ Ray Stern. 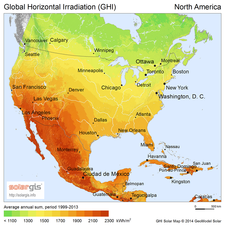 "Solana: 10 Facts You Didn't Know About the Concentrated Solar Power Plant Near Gila Bend". Phoenix New Times. Archived from the original on 11 October 2013. ^ "California produced so much solar power, electricity prices just turned negative". independent.co.uk. 11 April 2017. Archived from the original on 11 December 2017. Retrieved 30 April 2018. ^ Fares, Robert. "3 Reasons Hawaii Put the Brakes on Solar--and Why the Same Won't Happen in Your State". scientificamerican.com. Archived from the original on 20 September 2016. Retrieved 30 April 2018. ^ "Advantages of Using Molten Salt". Sandia National Laboratory. Archived from the original on 5 June 2011. Retrieved 29 September 2007. ^ Platzer, M.D., 2012. US solar photovoltaic manufacturing: Industry trends, global competition, federal support. Washington, DC: Congressional Research service. ^ Joern Hoppmann; Jonas Volland; Tobias S. Schmidt; Volker H. Hoffmann (July 2014). "The Economic Viability of Battery Storage for Residential Solar Photovoltaic Systems - A Review and a Simulation Model". ETH Zürich, Harvard University. Archived from the original on 3 April 2015. ^ "Tesla launches Powerwall home battery with aim to revolutionize energy consumption". Associated Press. 1 May 2015. Archived from the original on 7 June 2015. ^ "Seasonal Energy Storage in a Renewable Energy System" (PDF). semanticscholar.org. Archived (PDF) from the original on 25 May 2017. Retrieved 30 April 2018. ^ "The Combined Power Plant: the first stage in providing 100% power from renewable energy". SolarServer. January 2008. Archived from the original on 14 October 2008. Retrieved 10 October 2008. ^ Collings AF, Critchley C. Artificial Photosynthesis. From Basic Biology to Industrial Application. Wiley-VCH. Weinheim (2005) p. x ISBN 3-527-31090-8 doi:10.1002/3527606742. ^ a b c d Alsema, E.A. ; Wild – Scholten, M.J. de; Fthenakis, V.M. Environmental impacts of PV electricity generation – a critical comparison of energy supply options Archived 6 March 2012 at the Wayback Machine ECN, September 2006; 7p. Presented at the 21st European Photovoltaic Solar Energy Conference and Exhibition, Dresden, Germany, 4–8 September 2006. ^ a b c Fridleifsson, Ingvar B.; Bertani, Ruggero; Huenges, Ernst; Lund, John W.; Ragnarsson, Arni; Rybach, Ladislaus (11 February 2008). O. Hohmeyer and T. Trittin, ed. "The possible role and contribution of geothermal energy to the mitigation of climate change" (PDF). Luebeck, Germany: 59–80. Archived from the original (PDF) on 22 July 2011. Retrieved 6 April 2009. ^ Lund, John W. (June 2007). "Characteristics, Development and utilization of geothermal resources" (PDF). Geo-Heat Centre Quarterly Bulletin. 28 (2). Klamath Falls, Oregon: Oregon Institute of Technology. pp. 1–9. ISSN 0276-1084. Archived (PDF) from the original on 17 June 2010. Retrieved 16 April 2009. ^ "Portable Solar Panels". Portable Solar Panels for Sale. Archived from the original on 26 July 2012. ^ NREL, Life Cycle Greenhouse Gas Emissions from Electricity Generation Archived 28 March 2015 at the Wayback Machine, NREL/FS-6A20-57187, Jan 2013. ^ David D. Hsu and others, Life Cycle Greenhouse Gas Emissions of Crystalline Silicon Photovoltaic Electricity Generation: Systematic Review and Harmonization Archived 4 March 2016 at the Wayback Machine, 2011. ^ "Electric cars not solar panels, says Environment Commissioner". Parliamentary Commissioner for the Environment. 22 March 2016. Archived from the original on 3 April 2016. Retrieved 23 March 2016. ^ "Photovoltaics Report" (PDF). Fraunhofer ISE. 28 July 2014. pp. 28–32. Archived (PDF) from the original on 31 August 2014. Retrieved 31 August 2014. ^ Andrew Blakers and Klaus Weber, "The Energy Intensity of Photovoltaic Systems" Archived 17 July 2012 at the Wayback Machine, Centre for Sustainable Energy Systems, Australian National University, 2000. ^ Jinqing Peng, Lin Lu, Hongxing Yang, Review on lifecycle assessment of energy payback and greenhouse gas emission of solar photovoltaic systems. In: Renewable and Sustainable Energy Reviews 19, (2013), 255–274, Fig. 5, doi:10.1016/j.rser.2012.11.035. ^ C. Reich-Weiser, D. Dornfeld, and S. Horne. 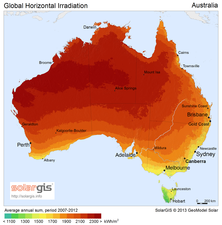 Environmental assessment and metrics for solar: Case study of solfocus solar concentrator systems Archived 6 April 2013 at the Wayback Machine. UC Berkeley: Laboratory for Manufacturing and Sustainability, 8 May 2008. ^ Service Lifetime Prediction for Encapsulated Photovoltaic Cells/Minimodules Archived 4 March 2016 at the Wayback Machine, A.W. Czanderna and G.J. Jorgensen, National Renewable Energy Laboratory, Golden, CO.
^ Joshua Pearce and Andrew Lau, "Net Energy Analysis For Sustainable Energy Production From Silicon Based Solar Cells" Archived 15 September 2011 at Wikiwix, Proceedings of American Society of Mechanical Engineers Solar 2002: Sunrise on the Reliable Energy Economy, editor R. Campbell-Howe, 2002. ^ a b Meldrum and others, "Life cycle water use for electricity generation: a review and harmonization of literature estimates," Environmental Research Letters, 2013, v.8. ^ Nathan Bracken and others, Concentrating Solar Power and Water Issues in the U.S. Southwest, National Renewable Energy Laboratory, Technical Report NREL/TP-6A50-61376, March 2015, p.10. ^ John Macknick and others, A Review of Operational Water Consumption and Withdrawal Factors for Electricity Generating Technologies Archived 6 April 2015 at the Wayback Machine, National Renewable Energy Laboratory, Technical Report NREL/TP-6A20-50900. ^ Utility-Scale Solar Power: Responsible Water Resource Management, Solar Energy Industries Association, 18 March 2010. ^ Concentrating Solar Power Commercial Application Study Archived 26 December 2017 at the Wayback Machine, US Department of Energy, 20 Feb. 2008. ^ John Macknick and others, A Review of Operational Water Consumption and Withdrawal Factors for Electricity Generating Technologies Archived 9 August 2017 at the Wayback Machine, NREL, Technical Report NREL/TP-6A20-50900. ^ Many newer power plants have cooling systems that Reuse Water Archived 26 December 2017 at the Wayback Machine, US EIA, 11 Feb. 2014. ^ a b Werner, Jürgen H. (2 November 2011). "Toxic Substances In Photovoltaic Modules" (PDF). postfreemarket.net. Institute of Photovoltaics, University of Stuttgart, Germany - The 21st International Photovoltaic Science and Engineering Conference 2011 Fukuoka, Japan. p. 2. Archived from the original (PDF) on 23 September 2014. Retrieved 23 September 2014. ^ "CdTe PV: Real and Perceived EHS Risks" (PDF). bnl.gov. Archived (PDF) from the original on 27 June 2017. Retrieved 30 April 2018. ^ "Solar plant's downside? Birds igniting in midair". CBS News. 18 August 2014. Archived from the original on 19 August 2014. ^ "California's new solar power plant is actually a death ray that's incinerating birds mid-flight". ExtremeTech.com. 20 August 2014. Archived from the original on 19 October 2014. ^ Jake Richardson (22 August 2014). "Bird Deaths From Solar Plant Exaggerated By Some Media Sources". Cleantechnica.com. ^ Hertwich and others, "Integrated life-cycle assessment of electricity-supply scenarios confirms global environmental benefit of low-carbon technologies" Archived 23 November 2015 at the Wayback Machine, Proceedings of the National Academy of Sciences, 19 May 2015, v.112 n.20. ^ Layton, Julia (5 November 2008). "What is a luminescent solar concentrator?". Science.howstuffworks.com. Archived from the original on 10 March 2010. Retrieved 19 April 2011. ^ "Kyocera, partners announce construction of the world's largest floating solar PV Plant in Hyogo prefecture, Japan". SolarServer.com. 4 September 2014. Archived from the original on 24 September 2015. ^ "Running Out of Precious Land? Floating Solar PV Systems May Be a Solution". EnergyWorld.com. 7 November 2013. Archived from the original on 26 December 2014. ^ "Sunflower Floating Solar Power Plant In Korea". CleanTechnica. 21 December 2014. Archived from the original on 15 May 2016. ^ "Napa Winery Pioneers Solar Floatovoltaics". Forbes. 18 April 2012. Archived from the original on 1 January 2012. Retrieved 31 May 2013. ^ "A look at a Chinese fishery with a giant integrated solar array – feeding a world hungry for clean energy". Electrek. 29 January 2017. Archived from the original on 29 January 2017. Retrieved 29 January 2017. Carr, Donald E. (1976). Energy & the Earth Machine. W. W. Norton & Company. ISBN 978-0-393-06407-0. Tritt, T.; Böttner, H.; Chen, L. (2008). "Thermoelectrics: Direct Solar Thermal Energy Conversion". MRS Bulletin. 33 (4): 355–372. doi:10.1557/mrs2008.73. This page was last edited on 7 April 2019, at 03:06 (UTC).